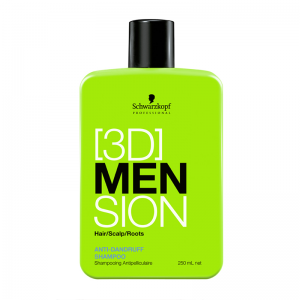 Dandruff shampoo for men is a hair and scalp care product designed to provide the special care necessary to treat dandruff. Dandruff results from a dry scalp and is recognizable by white, flaky sediments within and around the hair. Most dandruff shampoo products treat both the hair and the scalp with the intention of eliminating the tiny but often noticeable flakes of dandruff. Additionally, this type of shampoo can effectively treat the root cause of dandruff, which is most often simply a dry scalp but other causes are possible as well. 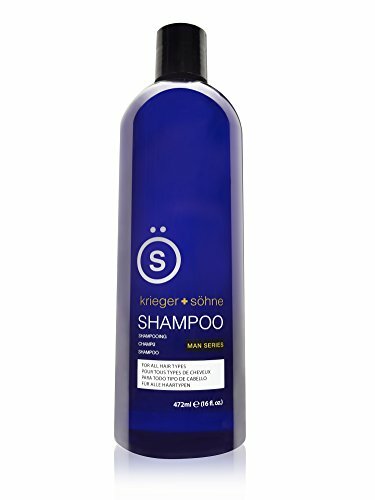 This K & S (Krieger & Sohne) product comes in a large-sized 16-ounce bottle, specifically designed for a balance of general hair treatment such as cleansing, strengthening, conditioning and dandruff treatment, including dry scalp conditions and even the more extreme condition of Psoriasis. A key ingredient in this product is tea tree oil. The shampoo is infused with this natural healing agent that has numerous positive skin treatment effects. It increases natural body healing processes by increasing blood flow and decreasing skin inflammation directly. It also has anti-bacterial properties that act both on hair follicles and on the skin of the scalp. The shampoo is mint scented, in addition to the natural fragrance of the tea tree infusion. It is also expressly designed for all hair types, both long and short, dry and oily. While it has been designed for male hair in particular, it has been proven as an effective product for women too. As indicated by the manufacturer, there are no preservatives included in this shampoo and it is also marketed as a hair regrowth agent support product. Over 1200 online reviews have delivered an excellent 4.5 out of 5 star rating for this product, with many reviews pointing out its soothing and refreshing scent, thickening hair effect, almost immediate results, and no negative residue left behind after being rinsed out. This product is offered with a “100% Satisfaction Guarantee” by the manufacturer. Tiny, white flakes of dead skin appearing in small or large quantities in and around your hair is a sure sign you have a dandruff issue, which is a common annoyance for many males, with nearly half of all men experiencing it at some point during their lifetime. Developing a problem with dandruff can be caused by various factors, but as mentioned above, the most basic cause is simply a dry scalp. Dandruff shampoos of all sorts are available online, in drug and grocery stores, and convenience stores of all types. However, a relatively large percentage of physical location stores tend to carry a limited number of choices of dandruff shampoo. Results can vary greatly depending on what specific dandruff shampoo product you select and each offers relief of some kind, but some may not be very effective at treating the root causes of the problem. 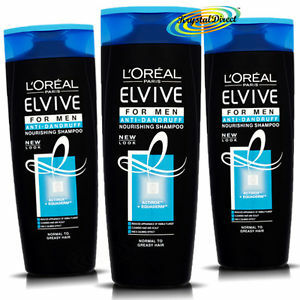 Dandruff shampoos, like many products, are distinguished by price, container or package size, effectiveness, and scent. These primary considerations are wisely kept in view by a smart buyer when it comes time to make a selection and purchase. Most dandruff shampoos will positively affect general hair health as well as the particular causes of the dandruff present in one’s hair. Thus, the best dandruff shampoos for men will usually offer at least basic hair care making hair look and feel good by strengthening the hair and conditioning it. Many shampoos also help to maintain the natural oil balance in hair follicles which aids in stronger and healthier hair. While individual hair conditions can vary considerably, it remains generally true that male hair is drier, less oily and less full compared to female hair. Prudent buyers should keep the frequency of recommended use in mind, as some dandruff shampoos have strict guidelines for how often and to what extent the product ought to be used in order to produce the best possible results. Specifically designed treatments for differing skin scalp conditions is yet another important consideration. 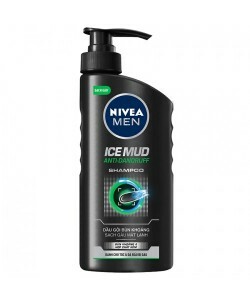 In fact, some dandruff shampoos for men have warnings to keep basic nutritional considerations in mind, as these are often involved in the production of the dry skin that produces dandruff. While some dandruff shampoos are aimed at restoring “Ph” balance, others utilize a menthol base, caffeine, coal tar, peppermint, tea tree oil, ginseng, and numerous other base ingredients for the sake of returning scalp conditions to normal. With this in mind, many buyers may benefit from looking closely at prospective products in order to determine if and how they will unblock oil glands in the scalp and supply or resupply vitamins or nutrients that are basic for hair health. Beyond all of the preceding considerations, some dandruff shampoos stand out for certain buyers in respect to their ability to deliver general hair care, whether conditioning, strengthening, cleansing, or any other factor. Indeed, buyers can even find a hair-regenerating dandruff shampoo of various sorts in today’s market, which may be especially attractive for those suffering from two or more hair conditions at once. As with all personal health care products, consumers should take into consideration the possibility of unusual or severe medical conditions such as psoriasis or eczema. Only health care specialists are qualified to accurately diagnose and treat these types of conditions. In some cases, a persistent dandruff condition may be the sign that an individual suffers from a skin affliction which will require treatment beyond any partially effective dandruff shampoo. While especially concerned and attentive buyers can readily find an anti-dandruff and specialized skin treatment shampoo product both online and in conventional shops and stores, it is recommended to consult with a professional hair and skin doctor to discuss all of your options. A medical health consultation is prudent and may be the best first step to take in determining how to treat the base conditions that are causing dandruff.